Patrick J. Sloyan is paying a visit today to Iowa's Grinnell College. Pulitzer Prize-winning journalist and author Patrick J. Sloyan is visiting Iowa’s Grinnell College today, to meet with and speak to students. 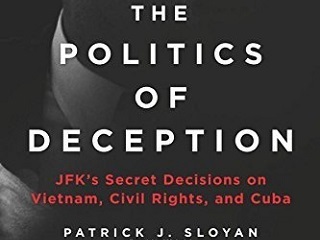 No doubt one of the topics will be his 2015 book The Politics of Deception: JFK’s Secret Decisions on Vietnam, Civil Rights, and Cuba. Sloyan won the Pulitzer Prize in 1992 for International Reporting, for a series of articles on “friendly fire” incidents and other American battlefield tactics during the Gulf War. And because we have been guilty of this kind of brain-freeze name switch ourselves, more than once, we noted that Tcheng mistakenly in her headline and intro paragraph refers to her interview subject as Robert Sloyan, perhaps thinking of JFK’s brother while writing. We’ve let her know.